The Related Patients tab of a patient's record. The Patient Information ribbon. If the ribbon is not visible, click (or tap) the arrow button below the Patient Search box . On the Patient menu, under General, click (or tap) Overview. The patient's Overview page opens. 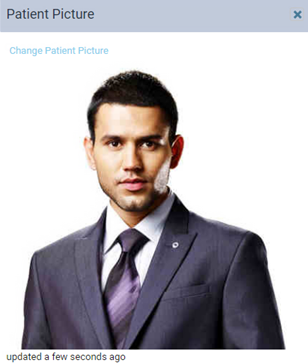 On a patient's Overview page, click (or tap) the patient picture on the left side of the Patient Information ribbon. If the ribbon is not visible, click (or tap) the arrow button below the Patient Search box . Tip: Alternatively, you can click (or tap) the patient picture on the Related Patients tab of the patient's record or click (or tap) the patient picture on the Appointment Information panel of any of the patient's appointments. The Patient Picture dialog box appears. Click (or tap) the Change Patient Picture link. The Patient Picture Library dialog box appears. 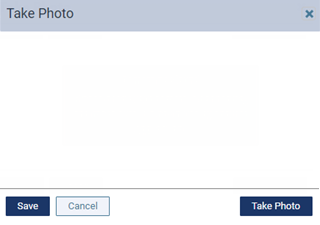 Note: In the lower part of the dialog box, and the thumbnail image that is currently assigned as the patient's picture is selected. Import an image - Click (or tap) Browse New Image to choose the image (a .gif, .jpg/.jpeg, or .png file less than 20 MB in size) that you want to import. Use an image from the document manager - Any images in the patient's document manager that have a "Patient Picture" tag attached to them appear in the lower part of the dialog box. Click (or tap) the thumbnail image that you want to assign as the patient's picture. Take a photo - Click (or tap) Take Photo to use your computer's (or device's) camera to take a photo to attach to the patient's record. In the Take Photo dialog box, click (or tap) Take Photo, and then click (or tap) Save. Any image that you import or photo that you take is added to the patient's document manager with a "Patient Picture" tag. 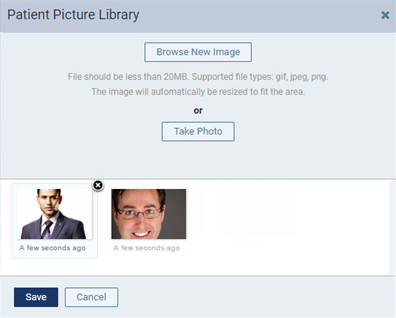 A thumbnail image, which will be visible wherever you can view patient pictures, is created (sized and cropped as needed) automatically when you import the image or take the photo. Images pass through an anti-virus scanner upon being uploaded. With the desired thumbnail image selected in the lower part of the dialog box, click (or tap) Save.